While it was believed that only bank jobs lure graduates, recruitments in other public sector organisations have also become the flavor of this season.Life Insurance Corporation`s (LIC) AAO recruitment 2013 seems to have generated lot of interest among aspirants as many ask us on how to prepare for LIC AAO exam. To help you attain best results we are publishing a list of things that you will need to prepare for LIC AAO recruitment exams that include books, blueprint, previous solved question paper & topics to cover in each paper. Just like IBPS clerical common exam the written test for aao jobs is also computer based (online) & you won’t have to shade circles in coding sheets.So time management is very important. Although the pattern looks similar to IBPS PO exams, there is a major difference with respect to marks.First let us look at the AAO exam pattern & section-wise marks. candidates must attend 160 questions for 400 marks in 120 minutes. No Descriptive Test: Although LIC had descriptive english paper previously, LIC AAO exams 2013 does not feature it. Hence weightage is more on objective english paper with 40 questions carrying 100 marks. Qualifying: It is compulsory to pass in each section and also secure minimum marks totally to qualify for interview stage.LIC will decide on sectional and total cutoffs after the exam based on your collective performance. For all those searching for LIC AAO previous years solved question papers, keep in mind that these materials serve only as reference.The corporation seems to have modified its pattern for 2013 AAO exams & hence don’t expect the test to reflect previous years. The educational qualification fixed for applicants was graduation pass.Hence questions shall be of +2/ degree level only. 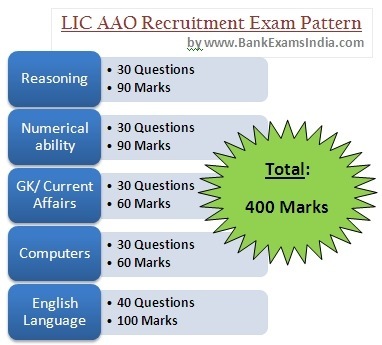 Those who have taken banking exams before wont find the sections in LIC AAO exam new but first time applicants might encounter confusions.So based on previous year recruitments for insurance jobs we have compiled certain important topics. Note: It is not possible to predict any syllabus in advance.Hence do not stick with these subjects alone.Try to cover maximum chapters & practice extensively using the above books to increase your chance of qualifying. This entry was posted in Bank Exams in India, Govt Jobs and tagged LIC AAO. Bookmark the permalink.